NO FOLLOWING NEEDED! We are not like the other salons. Looking to Meet Hair Stylists and Colorist. Are you looking for a professional salon environment that offers weekly advanced education to their team members? Are you looking to work with the finest hair care products like Oribe and Bumble and bumble? Are you looking to join a true team environment where you can take your career to the next level? Do you take Your Art of hairdressing seriously? What's it Like to Work at Chameleon? We are a full service salon located in North Haven. We are looking for team members who love the beauty industry and working with clients! Chameleon is a Team Based Model Salon. Everyone works together to take care of the client’s. We freely share clients with each other. We offer CAREERS to our employees … not just a job. We are a Salon Today Top 200 Salon. We pay great hourly rates and benefits. We only hire really nice and friendly team members. A following is NOT needed to join Chameleon. We offer competitive hourly rates and team bonuses. Our full time employees enjoy medical, dental, AFLAC, 401K,and employee discounts. We recommend retail products to all our clients. We want them to be able to create that “SALON LOOK” at home themselves. We carry great products like Bumble & bumble, Oribe, Dermalogica and glo Minerals makeup. Upbeat and positive attitude is required. Strong technical skills are required. We will provide you with education in our Chameleon University training and mentoring programs. Understand the importance of recommending retail to clients Great customer skills, you have to be trendy, fashionable and love the salon and spa atmosphere. You must have a passion for learning, because we view training as part of your job. 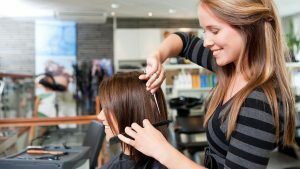 You will be required to attend paid in-salon and out-of-salon training, in places like New York City at the Goldwell Academy and Bumble University. Prior attendance at national / international salon academies a plus! We are looking for someone who is 100% dedicated to providing our clients with the best client experience at Chameleon Haircolor Café & Spa. We are open Monday to Sunday and you must be able to work any of these days. Tell Us Why You Want to Work at Chameleon?